Nomex (styled NOMEX) is a registered trademark for flame resistant meta-aramid material developed in the early 1960s by DuPont and first marketed in 1967. Many synthetic materials cascaded from DuPont research, forming the basis for many global businesses and products including household names such as Teflon® fluoropolymer resins and SilverStone® certified non-stick finishes, Stainmaster® flooring systems, Kevlar® brand fiber, Nomex® brand fiber and paper, Lycra® spandex fiber, Sontara® spun-laced fabric, Mylar® polyester film, Tyvek® spunbonded olefin, Cordura® nylon fiber, and Corian® solid surface material. 2007 marks the 40th anniversary of the commercialization of DuPont™ Nomex®, a revolutionary, heat and flame resistant fiber that when used in protective fabrics, garments, insulation and other high-performance applications help provide protection to millions of people and processes worldwide. 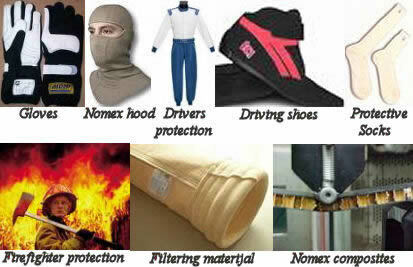 Nomex is an inherently flame-resistant, high-temperature fiber that will not melt, drip or support combustion in air. It also delivers outstanding resistance to a broad range of chemicals. You can find it as a paper, felt, fabric and in fiber forms. Nomex brand fiber is used in range of applications, but it is perhaps best known as a critical component in protective apparel. Today, almost all firefighters around the world are protected by Nomex for its unique combination of flame protection, durability and mobility. Nomex is also used by military pilots and combat vehicle crew; auto racing drivers, pit crew members and track officials. Nomex goes beyond protective apparel, though. Motor, generator, transformer and other electrical equipment manufacturers have counted on DuPont Nomex, the standard for electrical insulation, for more than 40 years. Honeycomb of Nomex paper is used for lightweight structural support and helps substantially improve the performance of most commercial aircraft. Race car drivers have to wear a multi-layer Nomex driving suit & flame-resistant gloves, long underwear, balaclava, socks and shoes to protect them in case of fire. The FIA provides specifications for the FIA Standard 8856-2000 flame-resistant clothing to be used in racing. Racing apparel of Nomex brand fiber plays a pivotal role in providing long-lasting protection and valuable seconds racing professionals need to escape and survive flash fires that result from both on-track collisions and pit accidents. Whether it is found in protective suits, underwear, socks or gloves, the exceptional flame-resistance provided by Nomex cannot be washed out or worn away. That's why all of the drivers competing in NASCAR, IRL, NHRA, CART, IRHA and Formula 1 events wear flame-resistant racing suits made with Nomex. Nearly all the pit crews, rescue teams and track officials who work in the presence of potential flash fires also depend on Nomex, because it protects them from intense heat and flame, provides the valuable seconds they need to escape fires and minimizes the potential for burn injury. 30.11 Drivers taking part in practice and the race must always wear the clothes, helmets and head and neck supports specified in the Code. standard. Users must ensure that garments are not too tight, as this reduces the level of protection. Embroidery sewn directly onto the overall shall be stitched onto the outermost layer only, for better heat insulation. Backing material of badges and thread used for affixing them to the overalls must be flameproof (see Appendix 1 of the FIA 8856- 2000 Standard for detailed requirements and instructions for use). Drivers of single-seater cars in races with standing starts must wear gloves in a high-visibility colour which contrasts with the predominant colour of the car, so that the driver can clearly draw the attention of the race starter in case of diffi culties. Substances which may circulate in any cooling system worn by a driver are restricted to water, or air at atmospheric pressure. Water systems must not require the saturation of a garment in order to function. For events taking place in extreme heat, it is recommended that a cooling system be used (connected, for example, to the underwear designed for that purpose and homologated according to the FIA 8856-2000 standard). Exceptionally, driver cooling vests which are not FIA homologated may be worn but shall be in addition to the mandatory homologated underwear. They must include a base garment certified and labelled to ISO 15025, any tubing must be certifi ed and labelled to ISO 17493 and must not be in contact with the driver's skin and any connection to an on-board system must comply with Article 5.8.6 of the FIA 8856-2000 standard.